Earlier this month Ben Thompson from Stratechery wrote a post, analyzing SAP's $8 billion acquisition of Qualtrics, that provides insight into the shift in value proposition of the academic LMS. The SAP explanation along enterprise software lines shows the broader shift of enterprise software extending the view of the internal operations of an organization to also include a deeper view of the end users of an organizations offerings - students in the case of the LMS. Thompson describes how SAP was founded in the 1970s and has a dominant position in Enterprise Resource Planning (ERP) systems that use central databases to provide customers with "a 'real-time' view of the state of their company" - essentially showing what the company is doing from an internal view. Customer Relationship Management (CRM) products emerged in the 1990s with the rise of ubiquitous PCs and the emerging Internet, tracking interactions with a company's customers across time and across multiple locations - essentially showing a view of who the customers are and their interactions. Thompson then describes the challenge that modern companies face. This same trend applies in education, with students being just as connected as faculty and staff of a college or university. Think of it this way: the O-data tells you what happened, the X-data tells you why it happened. This view of enterprise software navigating the larger trends of ubiquitous technology and connectivity, leading from the what to who to why, provides clarity on many of the trends we see in the ed tech world. While the modern LMS has advanced in many ways - particularly around usability, interoperability, and system reliability - the common usage of the this ERP-of-the-classroom has remained fairly steady. The dominant usage is managing the what of courses. 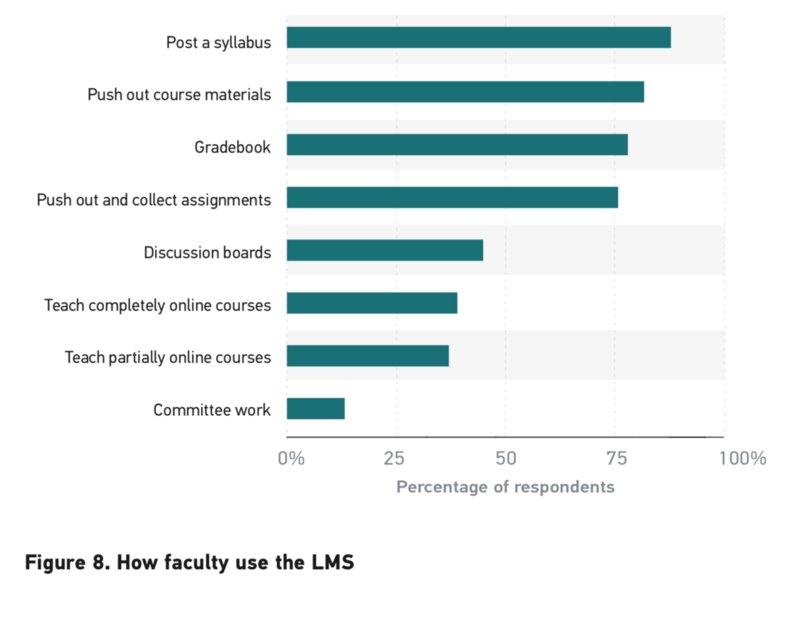 The LMS provides tools to manage communications - a view of the who of courses - through inbox, discussion boards, announcements, and various conferencing apps, but of these the dominant usage is through announcements. One way communication from faculty to students. The tools are there but not the reality of holistic views of interactions with students. The shift in education from running a course to guaranteeing great experiences for students, to bastardize the SAP explanation, is much like the move towards experience management referred to in the Stratechery article. The movement is in its infancy, and it is likely to be measured in terms of decades, not years. Michael referred to this move in his most recent post. When you talk about student success, and great experiences, you have to go well beyond the official production of course content and grades and rosters. It doesn't just matter what grades students get, it matters whether each student is learning, whether and when they get frustrated, and how often they're engaging in the class. This gets to learning analytics and formative assessments and opportunities for students to quickly get help. None of this is new, per se, and we've even seen attempts at alternative learning platforms to address this richer ecosystem. Consider the learning platforms designed initially to support competency-based education (CBE) such as Motivis Learning (spun out of Southern New Hampshire University's College for America) or Sagence Learning (formerly FlatWorld Knowledge). These systems1, often called Learning Resource Management (LRM) systems, are designed to "see a holistic view" of students and "track student engagement". They are designed to achieve the stated goals of SAP to combine operational data and tools along with experience data and tools. We'll get into more detail in future posts, but the category often labeled as adaptive courseware platforms are another example of next-generation systems that are designed to capture both operational data and experience data. These systems blur the boundaries between content and platforms and have the advantage of combining the two into a common design, which should allow deeper instrumentation of student activity during the learning process. These examples get to the common question of whether the LMS will survive and exist in 10 years. The original LMS concept was designed around a course, not the learner, and most usage is administrative in nature, not learning activities. Shouldn't next-generation systems like LRMs overtake the LMS market, as these companies expand beyond just CBE programs (see this post for context)? 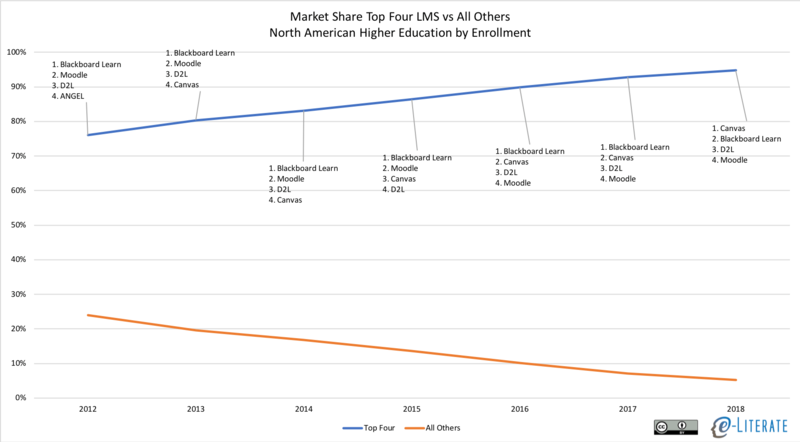 Well, the data do not show signs of this movement, and in fact the LMS market has been consolidating around just four solutions for institutional adoption - Canvas, D2L, Blackboard, and Moodle. In the meantime, most of the LMS vendors have been adding functionality, whether through extension of their platforms or strategic integrations with third party tools, that seeks to provide views of the student experience. Learning analytics and reporting capabilities, mastery learning additions, federated sharing of student activity data. One reason for the persistence of the primary LMS is that the LRM and courseware markets are not the ERP market. There are no SAPs in these worlds that already have ubiquitous usage. According to the Stratechery article "SAP is at the center of 77% of transactions worldwide". The LRM typically starts out in a new CBE program with dozens, or maybe hundreds of students. What is dominant in higher education circles? The LMS. It is one of the few ed tech solutions used in a majority of courses across online, blended, and face-to-face modalities. What the market appears to be doing is waiting for solutions that build on top of the LMS, or even extend the LMS itself, rather than replacing the LMS. And one of the main reasons is that the LMS has already been accepted as the enterprise system for academic usage, with operational data and tools managing the what of courses. It may be that over time alternative learning platform models will build up enough market share to become a credible threat to change the broader LMS market, but the signs so far are not encouraging for those vendors. Qualtrics proved to be so valuable ($8 billion) because it could augment the ubiquitous SAP. SurveyMonkey, by contrast, went public as a standalone company and is worth far less ($1.8 billion, still a respectable number). Looking into the future, the LMS will have to provide useful analytics on student outcomes, learning, and experiences along the way. Shifting from mostly running a course to guaranteeing great experiences for students. Whether this happens within the LMS of the future or as third-party augmentations of the LMS, and whether this happens with the current top four vendors or a different set, is not known. But the move to combine operational and experience data and tools is a trend we should expect to see over the next decade, both in ERP systems like SAP and in the academic LMS market.